It usually doesn’t take many pages of reading before you know you’ve hit a goldmine – – those books with plot and characters that reach out and grab you practically from the start. Magic spools across the pages, transporting you to another world and, for a while, nothing else matters. Forget the laundry waiting to be done, the errands you were set on running, phone calls waiting to be returned or even the latest home improvement project (we do a lot of those at my house)! Ditto watching TV. Television completely lost me when it ventured into the “reality” realm, but that’s a subject (rant, actually) for another post. This one is about books. Favorite books that inspire the conflict of I-want-to-reach-the-end-but -I-don’t-want-it-to-be-over. I can’t tell you how many times I’ve become involved in a novel, eager to learn how everything works out, but saddened when I do because I’ve reached the end of the story. It’s that feeling of anticipating Christmas for weeks and, then in a flash, it’s gone. The glow is still there but I want to spin back the clock and wallow in the magic all over again. By the same token, I have a few all-time favorite books that didn’t conjure that same feeling. “The Terror” by Dan Simmons is one of the best novels I’ve read (if not THE best) but I was satisfied when I reached the end. Maybe it was the length (close to 800 pages) or that the story had been expertly twisted in every conceivable direction. I journeyed with the characters, immersed myself in the setting, and was satisfied by the author’s resolutions. Amazing tale, one I highly recommend. I will always be in awe of that book. When I DO want a book to continue, it isn’t because I’ve found the ending unsatisfying, but because I’m not ready to part with the characters. 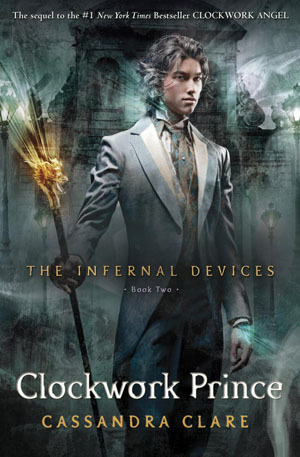 Case in point – – I just finished Clockwork Angel and Clockwork Prince, Books 1 and 2 of the Infernal Devices trilogy by Cassandra Clare. I couldn’t wait to reach the end of the second novel, biting my fingernails along the way, anxious to discover how everything worked out. And now that it’s over I’m disappointed there is nothing more. How will I survive without angelic Nephilim, colorful Downworlders and Victorian-era Mundanes? I know Clockwork Princess is coming in November/December, but I’m impatient. Tessa, Will, and, especially Jem, have become family to me. I’ve hurt with them, laughed with them, fallen in love when they did, and defied impossible odds at their sides. I rushed to reach the conclusion but, now that I have, I’m like a kid who gobbled up all the candy and still wants more. And that translates into some freaking good candy, let me tell you! :)Fortunately, I have the Mortal Instruments series waiting in the wings (next on my list) but I’m saddened I need to leave the friends I made in the Infernal Devices. Good books are forever-treasures, we can revisit time and again, whenever we want. I do it often with those novels I love most. What are some of your favorites — stories that stay with you long after you’ve finished them? There’s nothing like a good read or a good recommendation! This entry was posted in Books, Musings and tagged Books, Musings by Mae Clair. Bookmark the permalink. I used to read a lot of Stephen King, and The Stand being my favorite— the expansive, complex themes he plots and weaves just had mind reeling. Lots of other great books before and in between but just not popping up in my cold-medicine drugged brain right now. More recently though, these stand out—Octavia Butler’s “Parable of the Sower” & “Parable of theTalents”. What she can do in just a few words, such bold writing and she’s writing right in the gut of the tragedy that life can inflict, pulls no punches, but does it so beautifully. I was just amazed at her skill, and Butler inspired me, to just TRY to put something compelling on the page. Neil Gaiman’s “American Gods” is just another case of a writer who can present something disturbing and complex and make it beautiful. I fell in love with the main character in AG, Shadow- I don’t think I’ll ever forget the guy. He crossed a line and connected to me in a way that took me by surprise. And now as I work my way through reading as many books as I can in the romance genre I want to write in- I realize that I’m a sucker for characters that hit me in that place Shadow did. Characters that come across the page, make me think, worry, and wonder about them during my reading their story, and long after. Sometimes the writing may not be fantastic, but the writer is a good storyteller and makes that happen for me, and when they do that–well, I’m a happy woman! I agree with you on gobbling our fav books up like candy and so wanting more. There are a few books series I’m just craving the newest one to drop. Sigh… nothing will satisfy the particular yummy taste they had. Sigh…. I feel your conection to these books and characters, Venice. And isn’t that what it’s all about – – characters we connect with, forming attachments and emotional bonds that remain long after the stories end. Hmmm . . . I think I’m going to have to check out American Gods. I’m not familiar with that one and you definitely made me curious about it!